EUS) Hementxe da duela guxi amaitu dudan ELKAR Fundazioarentzako ilustrazioa, nun helburua ipuin klasiko bat aukeratu eta bertako pertsonaiak idazten eta marrazten irudikatzea zen. Kasu hontan "Hiru Hartzak eta Begi-Urdin" ipuina aukeratu nuen, eskala oso ezberdineko pertsonaiak eduki nahi nituelako, ipuina autatu aurretik ere. Kontrastea elementu klabea da edozein iruditan: Kolorean, tonuan, detailean, pertsonaien jarreran eta noski, pertsonaien tamainan bertan. Horregatik ilustrazioaren kontakizun zentrala Begi Urdin eta Hartz Handiaren artean egotea aukeratu nuen, ikusleak kontraste hori zuzenean nabaritu zezan. Azpian amaierako konposaketa bere osotasunean. ENG) Here's an illustration commission I completed recently for ELKAR Foundation, where I had to revisit a classic tale and have the characters writing and painting. 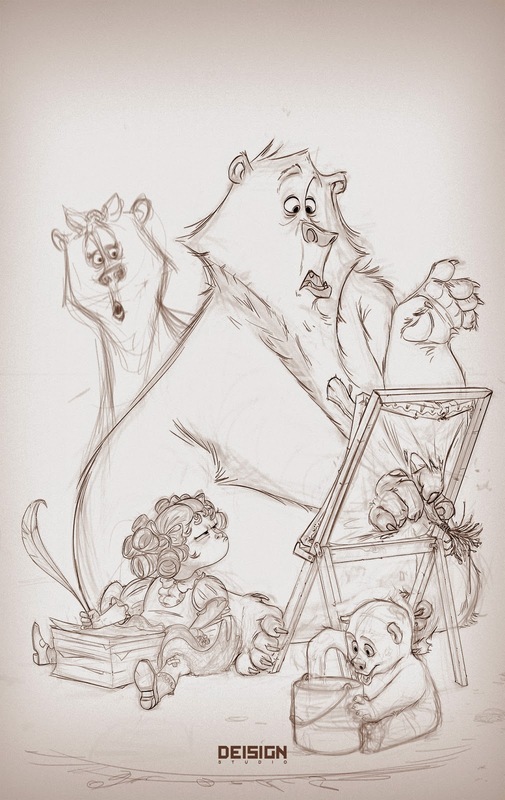 In this case I chose Goldilocks & The Three Bears, because even before I had started looking for classic tales, I knew I wanted to find one with great contrast between the size of its characters. 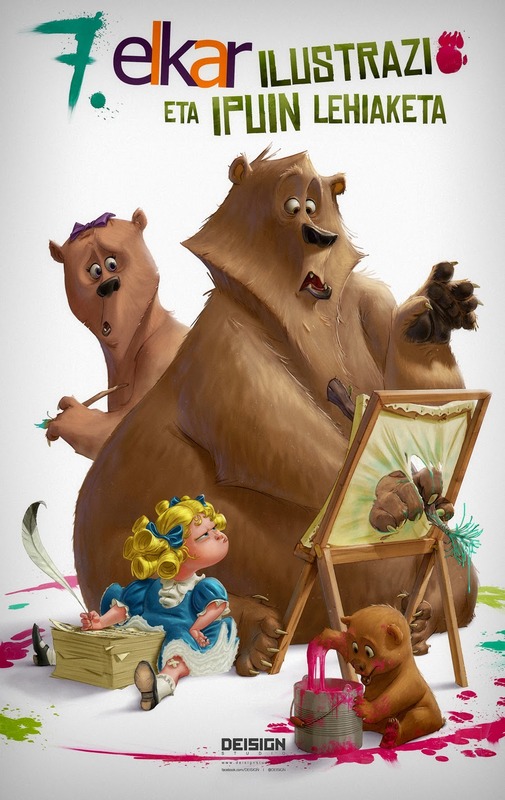 This is because contrast is one of the most important things in any illustration, in color, tone, detail, posing, attitude, and perhaps the most obvious one, the size of its characters. This just gives dynamism and excitement to the image, even comedy, and makes it more interesting to look at. Bellow is the final composition in its entirety. EUS) Ilustrazio honek, ELKAR Fundazioak urtero antolatzen duen Ipuin eta Ilustrazio Lehiaketaren kartela izateaz gain, dendetako irudi promozional nagusia ere izan behar zuen. Behean kartel-konposaketa nagusia eta zirriborroa, garbira pasatze prozesuan. ENG) This illustration I was commissioned is the poster for a writing and illustration competition that ELKAR Foundation holds in the Basque Country yearly, as well as their main billboard/brand image for the first part of the year. Bellow you'll find the main billboard and the half-cleaned up sketch that preceeded it. 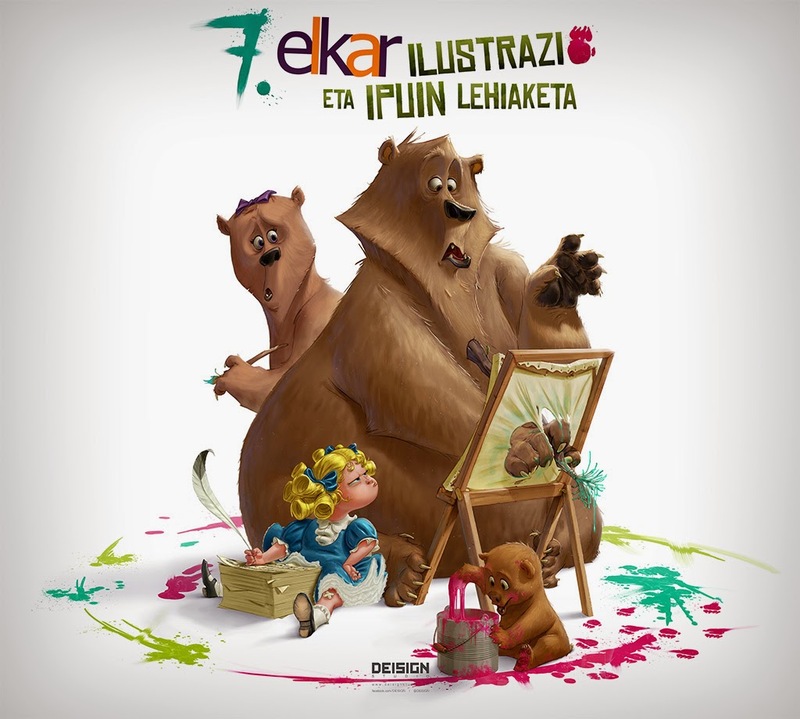 EUS) Azkenik, behean, ilustrazioa sortzearen prozesu bideoa ikusi dezakezue, John Berkhout-en musikaz. ENG) Finally, bellow you can see the process video of creating this illustration, with music by John Berkhout. EUS) Honelako lan gehiago sortzen lagundu nahi badidazu, zuri esker eta zuretzako sortutako ilustrazioak sustatu, edota nirekin marrazketa saioak eduki, galdera-erantzun sesioak, portfolio begiztatzeak etab., gehitu zaitez nire proiektu kolektibo berrira HEMEN!! ENG) If you'd like to help me create more works like this one, contribute to illustrations created for you and thanks to you, or even join me live in drawing sessions, Q&As, Portfolio Reviews and more... become my patron over HERE!! The contrast in sizes does make it more interesting. I like the facial expressions as well. The bear's coat look so soft. This is exceptionally basic for me as I am proficient article author that numerous individuals made one extremely basic inquiry which is that is edubirdy solid for getting the best paper on any theme. So subsequent to tuning in to their inquiry I gave them a little grin and answers them this site is 100% bona fide and helpful and from that point you can get the best article on any subject.